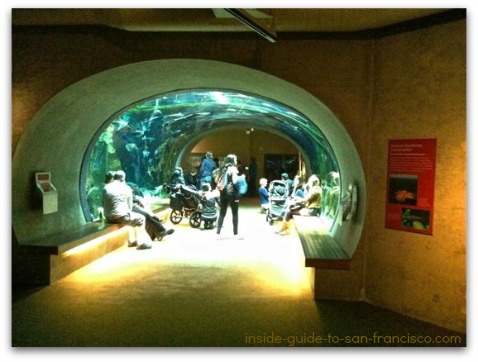 The California Academy of Sciences: a Local's Tips. A local's tips for a fun experience! 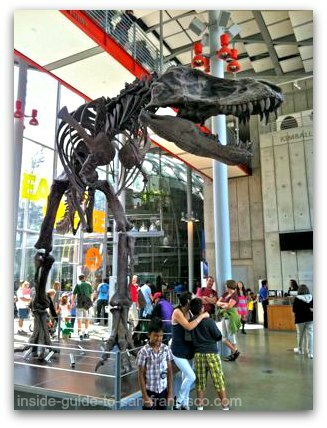 The California Academy of Sciences is an enormously popular San Francisco science museum, housing a Planetarium, Aquarium and Natural History Museum, as well as a well-respected research community of scientists. In 2008, the beloved old museum was torn down and an award-winning, "green" building was built to house the Academy and its exhibits. The new building has been massively hyped and has become very popular (and massively crowded), but there are many who miss the old museum. Nevertheless, the new one has a lot to offer and plenty of interesting things to see. Buy your tickets online and you (1) won't have to wait in the long line to buy tickets, and (2) won't have to pay the extra $5 charged on certain busy days. You can purchase your tickets through City Sightseeing online and pick up your tickets at the member desk when you go. 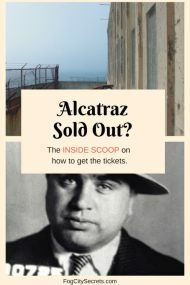 It doesn't cost any more to do it this way, and the lines to buy tickets can be long. To book Skip the Line Tickets, click here. The entry fees are a bit stiff, but there are ways to get a break. Free days for everyone, 4 Sundays a year. Check their website for upcoming ones. Go early, very popular. SF residents have free access fall and spring on certain days, by neighborhood; check the website for the schedule (www.calacademy.org/visit/). Become a member: free access all year, and you can bring a friend. Use members-only line to enter. Every Thursday night is party time at the Academy, for 21 and over, from 6-10 pm. $15 tickets, music, dancing, cocktails and entertainment of some kind. Check their website for events. Get tickets here. The Academy also has a full schedule of interesting workshops and lectures on a variety of scientific subjects. See website. Inside the walls are two huge domes housing the Planetarium and the Rainforest, and a large, glassed-enclosed box containing some plastic chairs and tables (the Piazza). The popular African Hall from the old museum was preserved and included in the new museum. The Steinhart Aquarium is in the basement, and what's left of the Natural History Museum exhibits are arranged mostly around the edges of the main floor. 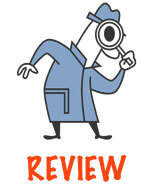 Insider Tip - When to Go: Enjoyment of your experience at the museum can hinge on when you go. If you can, avoid school holidays and weekends, or if you can't, go early. Best time to go: during the school week, after 1:30 or 2:00 p.m. An "inside source" told me most of the school field trips are in the morning, and have left by then. The films change periodically; they are professionally done and very interesting. 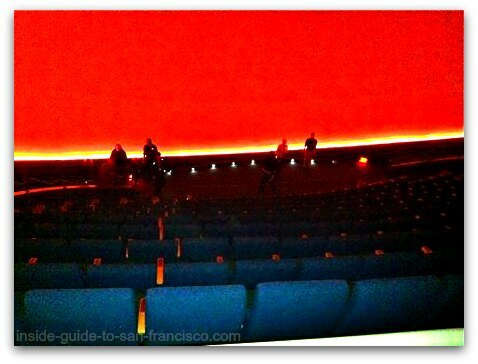 Caveat: the Planetarium shows fill up very quickly. One time I got there around 11:00 a.m. and it was already too late. Best strategy: get there first thing in the morning and zip around to the back of the Planetarium to the desk where they hand out the tickets (free) for that day's shows. Get your tickets first, then explore the rest of the museum. Hohfeld Hall: another theater just inside the entryway of the planetarium shows short films on various subjects. 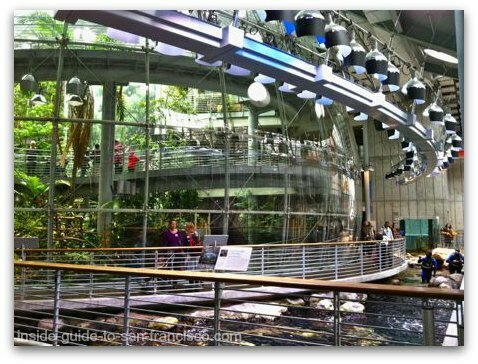 The Rainforest is an amazing, 4-level glass structure that recreates the plants and includes some of the creatures of three different rain forests: Borneo, Madagascar, and Costa Rica, all on different levels. At the bottom is the flooded Amazonian floor. As soon as you enter, the warmth and steaminess tell you you're in the tropics (kept at 82-85 degrees F. and 75% humidity). A winding ramp takes you all the way to the top. Getting in can require a bit of a wait; go early in the day or when the kids are in school. Over Christmas break, the wait was one hour; midweek, during the school year, there was no wait. Native plants from the three rain forests have been planted inside, including some lovely orchids and flowering cacao plants. Watch for the gorgeous Blue and Gold McCaw parrots on the bottom level. 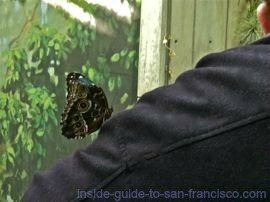 Most of the animals are in cages, but there are 100's of butterflies flying free inside the dome. Two of them sat on my wrist with their scratchy little feet, while I was trying to photograph something else. They are so tame, a staff member waits at the exit to check your clothing to make sure none of the butterflies are leaving with you! 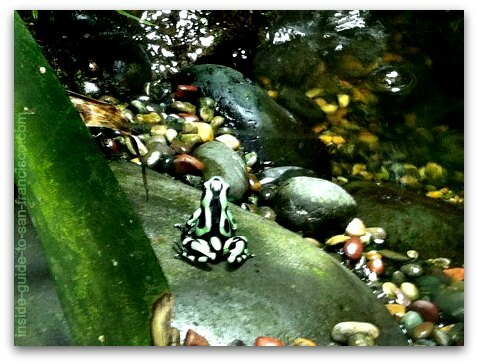 Lots of beautiful poison dart frogs in an array of colors are living in the Rainforest exhibit, but behind glass, as well as an interesting assortment of snakes and lizards. 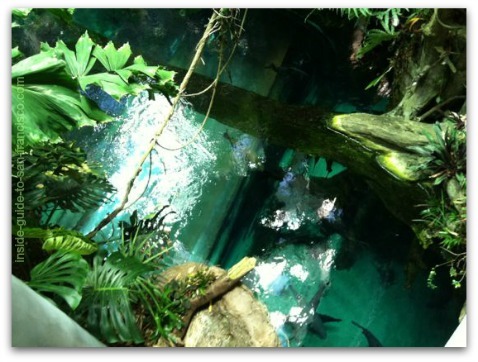 The cases with wildlife are scattered all through the Rainforest exhibit, matched up with their respective environments. But these big guys are running loose! Large Golden Orb-weaver spiders (Nephila clavipes) were introduced a couple of years ago and are building their webs in the rainforest now. 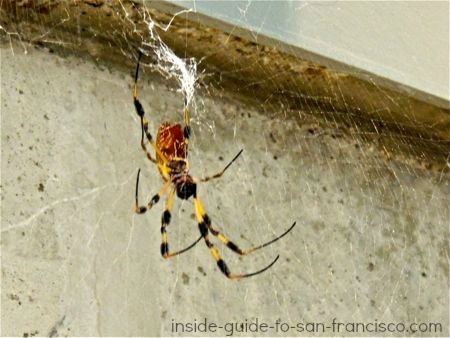 On one visit, I saw quite a few of them hanging in their webs just off the spiral ramp on the way up, but recently I only saw one in its web on the lowest level. The staff says they don't allow them to build their webs too close to the visitors; apparently, the spiders had gotten a bit too numerous and many had to be removed. They also have some of them in a glass case. Keep a sharp eye! They are considered venomous, but the bite only causes some local pain and redness in humans. And according to what I read, they only bite if they are pinched...?? Their webs can be a meter wide, and have been used to regenerate neurons; the fibers have a tensile strength ten times that of steel. Lions and tigers and bears! Well, lions and leopards, baboons, zebras and gazelles. The African Hall is the last holdout of the previous natural history museum on the premises. 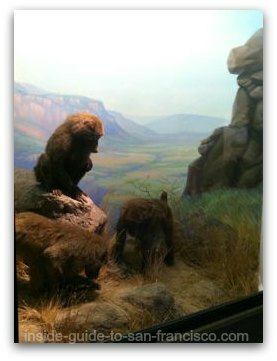 It's an old-style, taxidermied-animal display, with well-crafted scene paintings to provide a feeling of depth. My son really loved this section; it's one of my favorites as well. 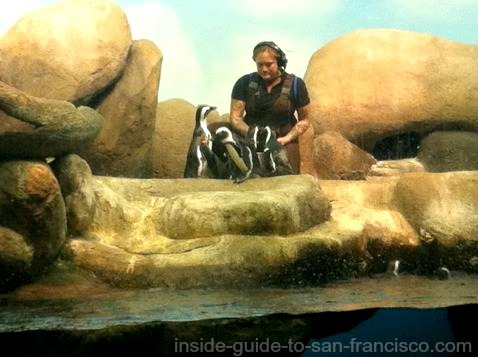 The watering hole diorama at the end has been replaced with a live penguin display. Penguin feedings are at 10:30 and 3:00, including an update on their marital arrangements. 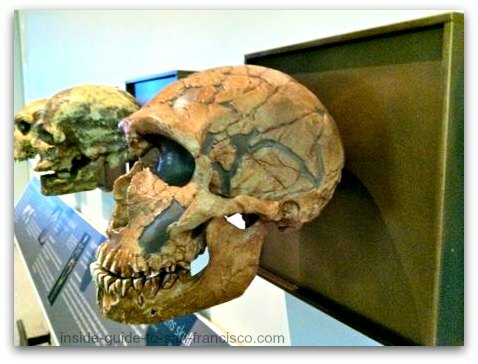 At the other end of the hall is an interesting exhibit, Human Odyssey, illustrating human evolution, including a selection of early hominid skulls. 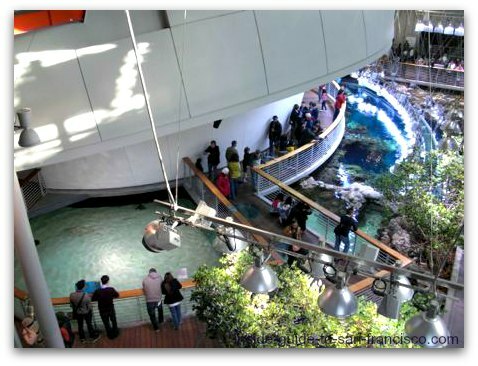 The aquarium is underneath the main level, accessible from the Swamp at the back of the museum. The aquarium is composed a different sections showcasing freshwater and ocean creatures from different parts of the planet. 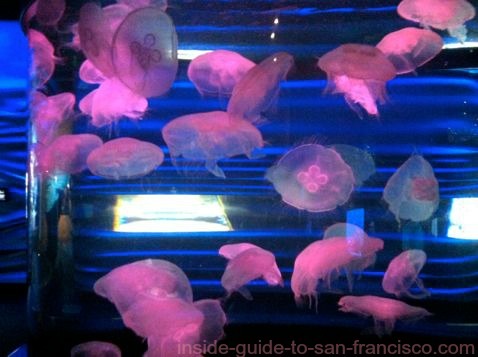 Not just fish - look for snakes, amphibians and insects, as well as tanks of ethereal jelly fish. Walk through the acrylic tunnel under the flooded floor of the Rainforest. They say there are piranhas in there. 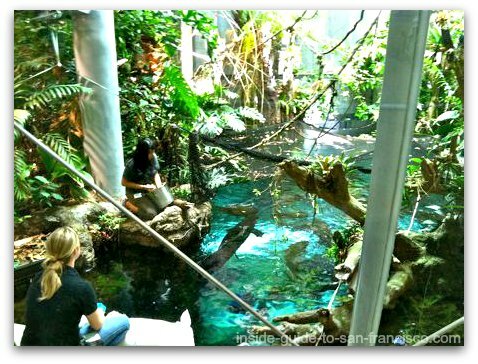 The Swamp is a holdover from the old California Academy of Sciences, a glimpse down into the water world of the aquarium on the lower level. 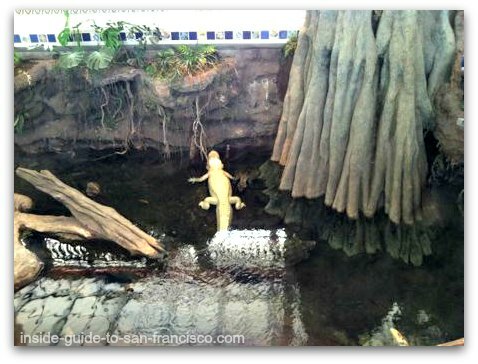 The rare albino alligator, Claude, is a favorite of visitors. The entrance to the Steinhart Aquarium is off to the left side of the Swamp. 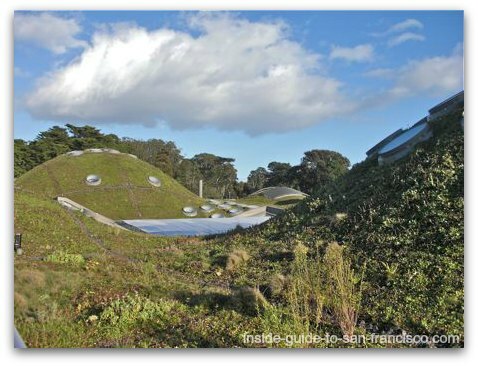 One of the most-admired features of the design is the Living Roof. Over 2 acres of plants cover the roof of the museum, with lots of portholes sprinkled here and there for light and air. The greenery keeps the building 10 degrees cooler than it would normally be, and rainwater is collected for irrigation. There's a small viewing platform towards the front of the building, on the right side, top level. 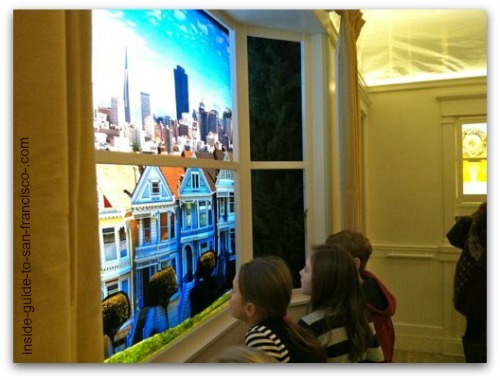 Want to experience a big San Francisco earthquake without any risk? I finally made it into the Shake House on an off day when the lines were short - it was great! Unless you have a fear of earthquakes, this is a pretty amazing exhibit. You go into the exhibit in a group, and watch a short video about the quakes. Then on into a dollhouse facsimile of a San Francisco Victorian, chandelier and all. Hang on to the railings, because here comes the 1989 Loma Prieta quake! And just when you've caught your breath, pow! The Big One! 7.9 on the Richter scale, April 18, 1906. It's not really scary, but the power is impressive; I was in there with a group of 7 year olds and they were having grand time (you have to be at least 4 years old to go in there). It is a powerful reminder, however, of what's practically under our feet. I was in SF for the 1989 quake and the simulation felt pretty much as I remembered it. The 1906 sim is a wake-up call for us locals. The Academy Cafe (informal) is on the main level, and the Moss Room (fancier) is downstairs. Or you can eat outside at the Terrace (good food, less crowded, and quieter). Three nice gift shops: big variety of tempting books, toys, games, and gadgets. Take home a cuddly version of Claude. 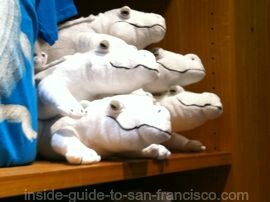 The Academy had its start in 1853 as an organization of scientists and gradually morphed into the museum we have now in Golden Gate Park . 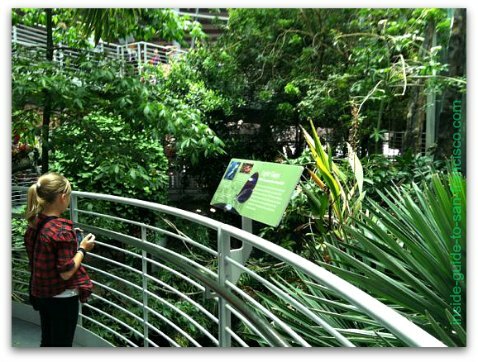 In addition to the exhibits created for the public, the Academy is a major research institution that emphasizes natural history, botany, biology, anthropology and the environment. The 1906 earthquake tragically destroyed the building on Market street, along with most of its collection, and they basically had to start over. 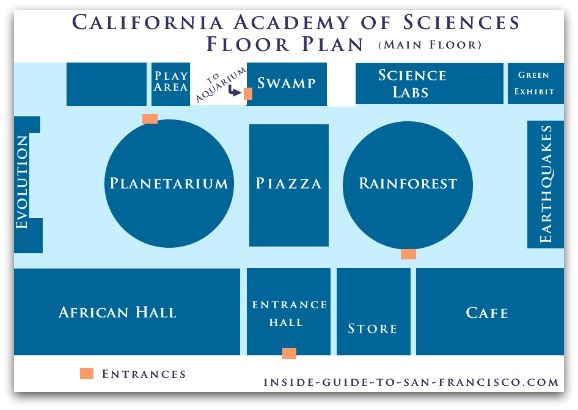 The California Academy of Sciences moved to its present location in Golden Gate Park in 1916, and subsequently added more wings to the building as it added and aquarium and planetarium to the original natural history museum. 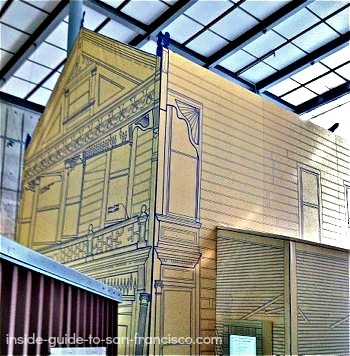 Yet another earthquake in 1989, the Loma Prieta, caused serious damage to parts of the building and required a move to a temporary home on Howard Street, in the South of Market area. There followed the usual political struggle about retrofit vs. tear down and rebuild, and again the new building faction won, similar to the story of the de Young Museum across the way. A well-respected Italian architect, Renzo Piano, was chosen to design the new building, which opened in 2008. The resulting building was praised to the skies by the architecture world and the media, and won numerous prestigious awards for it's green building materials and energy-conserving functions, such as using recycled blue jeans for insulation, and the sun for 90% of its lighting. 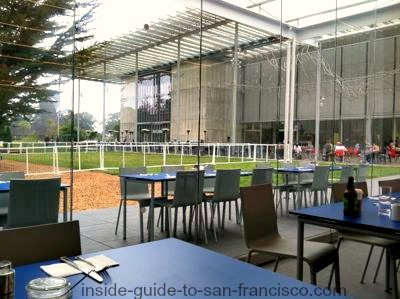 The California Academy of Sciences is located on MLK Drive in Golden Gate Park, across from the de Young Museum. See map below. 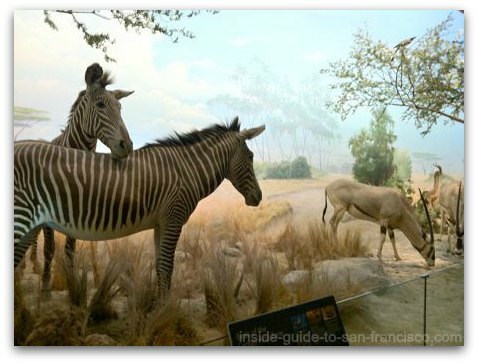 The 5-Fulton bus and the N-Judah streetcar will bring you within a couple of blocks of the museum. Parking can usually be found on MLK Drive within reasonable walking distance from the museum. On busy days (sunny weekends and days of very popular special exhibits), parking is trickier. 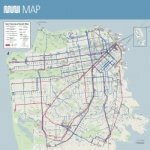 You'll have to park farther away on MLK or JFK Drives, or try the parking spots around Stow Lake nearby (about a five minute walk). Outside the park is much tougher. This section of JFK Drive (roughly from 19th Ave/Crossover Drive to the eastern end of the park) is closed to cars on Sundays, and is also closed on Saturdays in the summer (April through September). There's parking garage under the de Young Museum, a bit expensive ($3.50 to $4.00 per hour), but not terrible for a few hours. There is one entrance on 10th Avenue at Fulton, on the north side of the park, and another just off MLK Drive near the Academy of Sciences. In a nutshell, people seem to either love the new building or they are gnashing their teeth at what has replaced their favorite San Francisco museum. 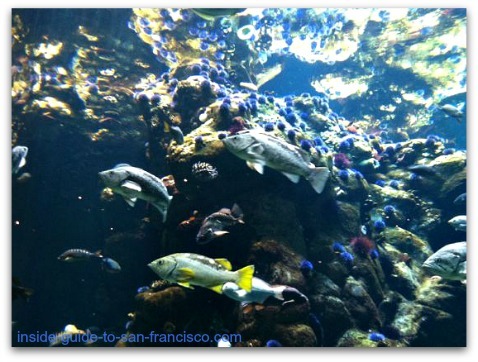 For more information, read my candid review of the new California Academy of Sciences. From talking to friends and acquaintances about this, there appears to be an even split between the two camps. Those who loved the old museum are unhappy, but those who never experienced the previous museum think the new one is great. The reviewers on yelp.com awhile back reflected the same division.